Download "BRANCHISING. 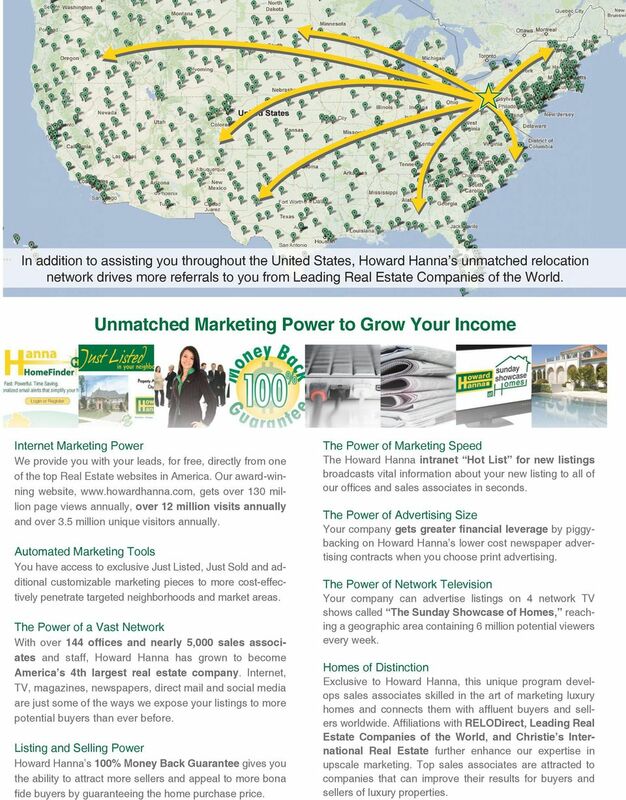 Drive more leads and more business to your company Experience the difference MARKETING TRAINING RECRUITING SUPPORT PROFITABILITY GROWTH"
2 HOWARD HANNA S CORPORATE HEADQUARTERS - PITTSBURGH, PENNSYLVANIA How is Branchising different? It s affordable, it s seamless, we provide ongoing management support, there are no nuisance charges or other hidden costs, and there is no regional advertising fund fee. 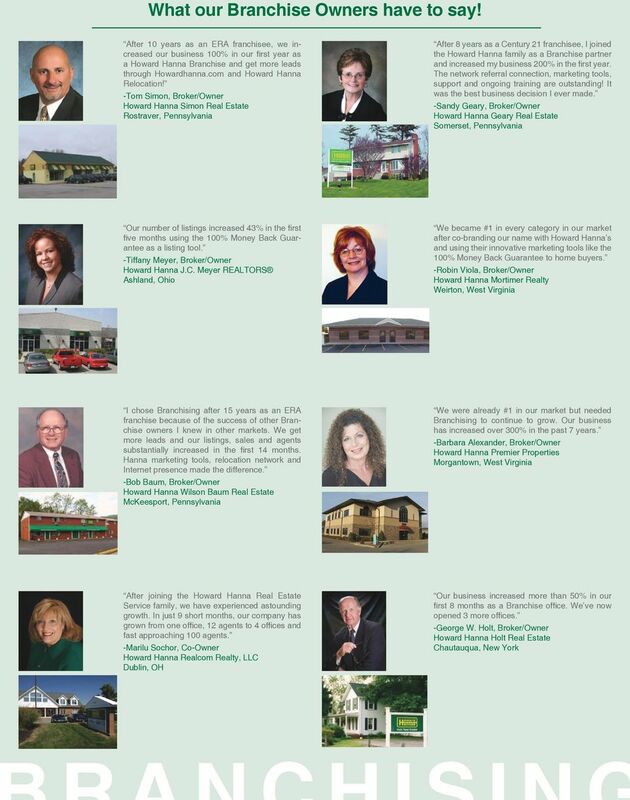 Branchise offices are full team members with the Howard Hanna team. Branchises actively participate in all company programs and events such as recruiting, sales training, relocation referrals, management seminars, and ongoing management support and counseling. Branchise owners benefit from utilizing exclusive Howard Hanna trademarked marketing tools, such as the Howard Hanna 100% Money Back Guarantee to home buyers. ONE TEAM - ONE DREAM We believe there is a difference between a franchising company in real estate and a leading real estate company in franchising. That s why Howard Hanna coined the term Branchising. 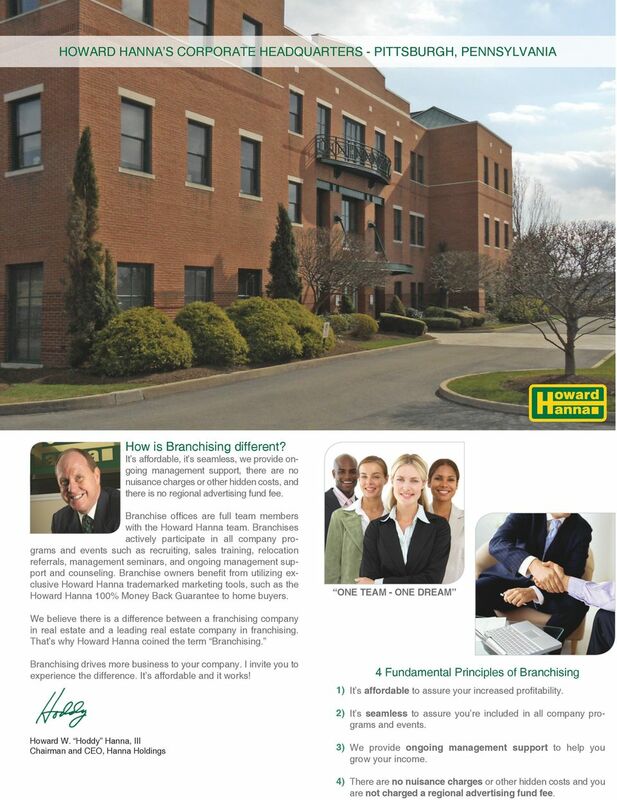 Branchising drives more business to your company. I invite you to experience the difference. It s affordable and it works! 4 Fundamental Principles of Branchising 1) It s affordable to assure your increased profitability. 2) It s seamless to assure you re included in all company programs and events. Howard W. Hoddy Hanna, III Chairman and CEO, Hanna Holdings 3) We provide ongoing management support to help you grow your income. 4) There are no nuisance charges or other hidden costs and you are not charged a regional advertising fund fee. 3 In addition to assisting you throughout the United States, Howard Hanna s unmatched relocation network drives more referrals to you from Leading Real Estate Companies of the World. Unmatched Marketing Power to Grow Your Income Internet Marketing Power We provide you with your leads, for free, directly from one of the top Real Estate websites in America. Our award-winning website, gets over 130 million page views annually, over 12 million visits annually and over 3.5 million unique visitors annually. Automated Marketing Tools You have access to exclusive Just Listed, Just Sold and additional customizable marketing pieces to more cost-effectively penetrate targeted neighborhoods and market areas. The Power of a Vast Network With over 144 offices and nearly 5,000 sales associates and staff, Howard Hanna has grown to become America s 4th largest real estate company. Internet, TV, magazines, newspapers, direct mail and social media are just some of the ways we expose your listings to more potential buyers than ever before. Listing and Selling Power Howard Hanna s 100% Money Back Guarantee gives you the ability to attract more sellers and appeal to more bona fide buyers by guaranteeing the home purchase price. The Power of Marketing Speed The Howard Hanna intranet Hot List for new listings broadcasts vital information about your new listing to all of our offices and sales associates in seconds. The Power of Advertising Size Your company gets greater financial leverage by piggybacking on Howard Hanna s lower cost newspaper advertising contracts when you choose print advertising. The Power of Network Television Your company can advertise listings on 4 network TV shows called The Sunday Showcase of Homes, reaching a geographic area containing 6 million potential viewers every week. Homes of Distinction Exclusive to Howard Hanna, this unique program develops sales associates skilled in the art of marketing luxury homes and connects them with affluent buyers and sellers worldwide. Affiliations with RELODirect, Leading Real Estate Companies of the World, and Christie s International Real Estate further enhance our expertise in upscale marketing. Top sales associates are attracted to companies that can improve their results for buyers and sellers of luxury properties. 4 Cutting-edge Recruiting, Training & Group Health Care Fast Start Sales Training Classroom training for newly licensed associates covers the basics in real estate to establish a foundation upon which to build. In Our Classroom and at Your Office Sales associates learn how to use Howard Hanna s innovative tools and programs effectively, including our exclusive 100% Money Back Guarantee and Hanna2Go. Our training equips new and experienced sales associates with cuttingedge practices that enhance their value to today s sellers and buyers. This effectively differentiates your agents from the competition, enabling your team to compete more effectively for every listing and sale opportunity. Online Continuing Education You and your team get the Howard Hanna time-saving advantage and convenience of accredited courses online to stay current with continuing education requirements for routine license renewal. Advanced Sales Training Your team benefits from the availability and convenience of specialized and accredited education courses for Residential Relocation Specialist, Distinctive Homes Marketing, New Construction Sales and more. Professional designation courses such as CRB, CRS and others are offered locally. Howard Hanna brings these courses to various regional locations to provide an additional incentive to sales associates by reducing time spent away from the office and the cost of travel and lodging. Corporate Recruiting Program Howard Hanna provides Branchise owners with prospects generated through their year-round Corporate Recruiting Initiative. Potential sales associates and staff members identified in your local market area are referred directly to you for interviews. This service is included at no additional cost to Branchise partners. Hanna Travel Worldwide Howard Hanna Branchise partners and their sales associates are provided with access to annual incentive trips to places like Hawaii, Paris, Rome, Las Vegas, Miami and more! These fun, exclusive Howard Hanna events cultivate more interoffice referrals, boost team morale and create more opportunities for shared learning to benefit your sales team and increase their income. Group Health Insurance Howard Hanna s Secure Advantage Group Health Insurance is open to Branchise team members. Having affordable health insurance provides a point of differentiation over most competing real estate brokerage firms. 5 Support and Profitability Ongoing Consulting & Support Business consultants can be expensive. With a Howard Hanna Branchise, you have access to some of the industry s best minds right in your local market area. Branchise partners have full access to all Howard Hanna programs. Equally important is the additional management support necessary to implement those programs successfully into your offering of services to your clients and customers. Online, on the Phone, and in Your Office Your Branchise support team is there for you. Whether you prefer , telephone or face-to-face interaction, your Branchise Support Team can accommodate you. From goal setting to P&L analysis, our team approach will ensure that we provide you with the best assistance available in each facet of your business. Your Bottom Line There is a direct relation between price and value as they apply to anything you buy. Tools to run your business are no different. Your Howard Hanna Branchise provides you with access to the same tools that have been used to build the 4th largest real estate company in America. Since 1957, the Howard Hanna Company has been crafting tools, systems and strategies to compete more effectively in their real estate brokerage business. Branchising with Howard Hanna may be the most cost-effective way to acquire the established, proven tools and systems you need to manage and grow your bottom line. Adapting to a Changing Market Today s buyers and sellers expect more service from their real estate professional. Your Howard Hanna Branchise equips you with the tools you need to meet and exceed their expectations. As you adapt and your sales associates implement the tools and systems best suited for your market, you will likely experience a new level of success. Mergers & Acquisitions Many owners of real estate brokerage firms do not have a viable exit strategy. As you explore expansion plans for your business, you may decide to acquire a competing company as a way to gain market share. Howard Hanna can help you by finding and funding merger and acquisition opportunities. Additionally, if your plan is to sell your business at some point, your Howard Hanna Branchise team can help you to identify a buyer for your business at the appropriate time. Hannamobile You can offer your Associates a hand with one of the most important tools they have...their car. They can work hard and qualify for a monthly Hannamobile Allowance. A truly effective marketing tool working hard for you every day! 6 Is Branchising right for your team? Our Branchise Team Partners tell us: It s much easier to recruit more successfully both new and experienced sales associates. It reduces the cost in both dollars and time to have the best Internet marketing technology and support. It significantly reduces the demands on your time to train new associates, retrain and retain experienced associates and maintain continuing education. It s easier to maintain listing, selling, managing, training, administrating and relaxing. You get many more quality incoming referrals and more high-end listings and sales. You keep more of the money you earn each year rather than less (compared to national franchising). It surrounds you with trusted peers with whom you can confidentially discuss real estate-related issues or transaction problems when there is a need. Your income can grow significantly in the first year. It makes owning and managing a real estate company fun again. They wish they had done it sooner! HOWARD HANNA BRANCHISE 2013 SURVEY RESULTS 1. 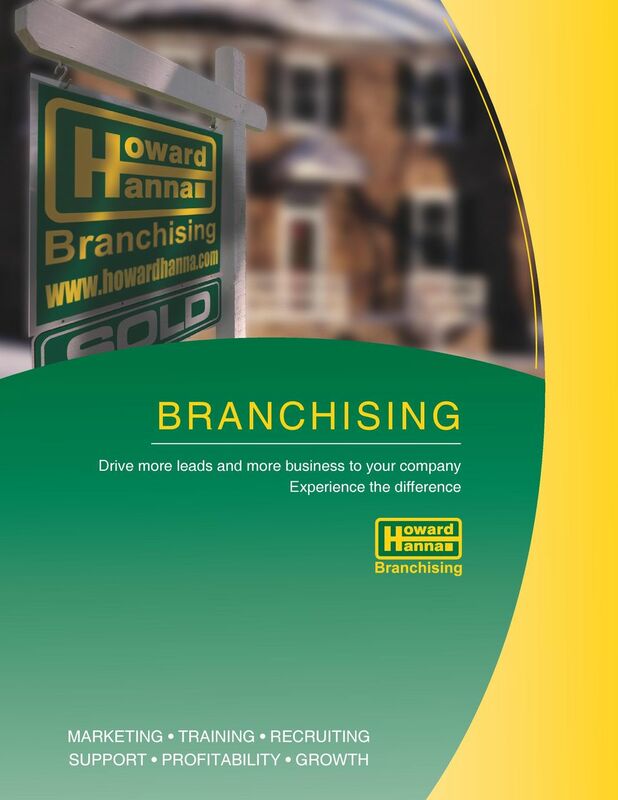 My affiliation with Howard Hanna as a Branchise partner provides more leads than I had on my own. 100% Agree 2. My affiliation with Howard Hanna as a Branchise partner improves my ability to get listings. 95% Agree 3. 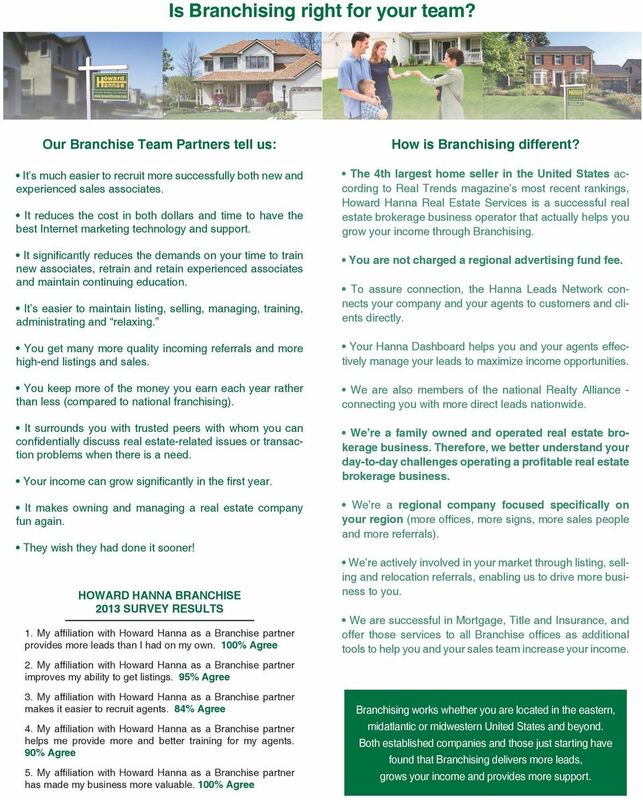 My affiliation with Howard Hanna as a Branchise partner makes it easier to recruit agents. 84% Agree 4. 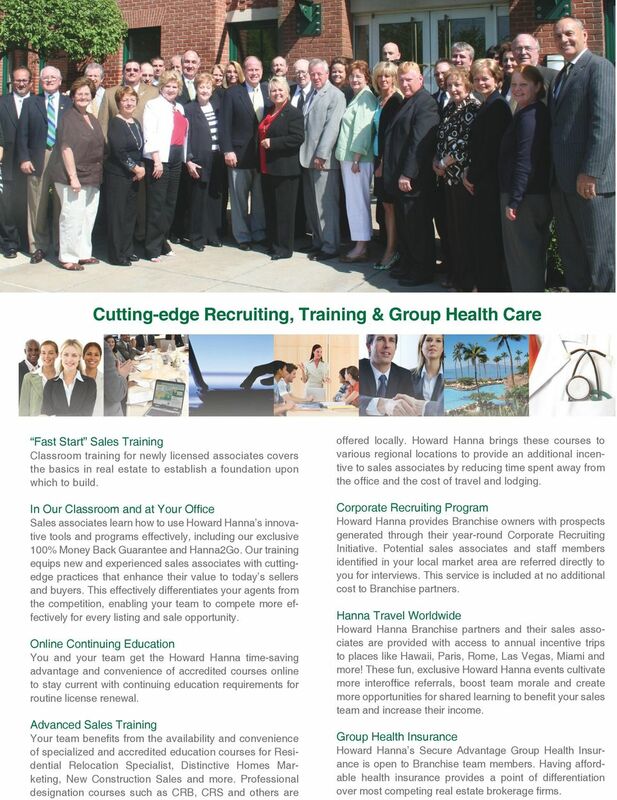 My affiliation with Howard Hanna as a Branchise partner helps me provide more and better training for my agents. 90% Agree 5. 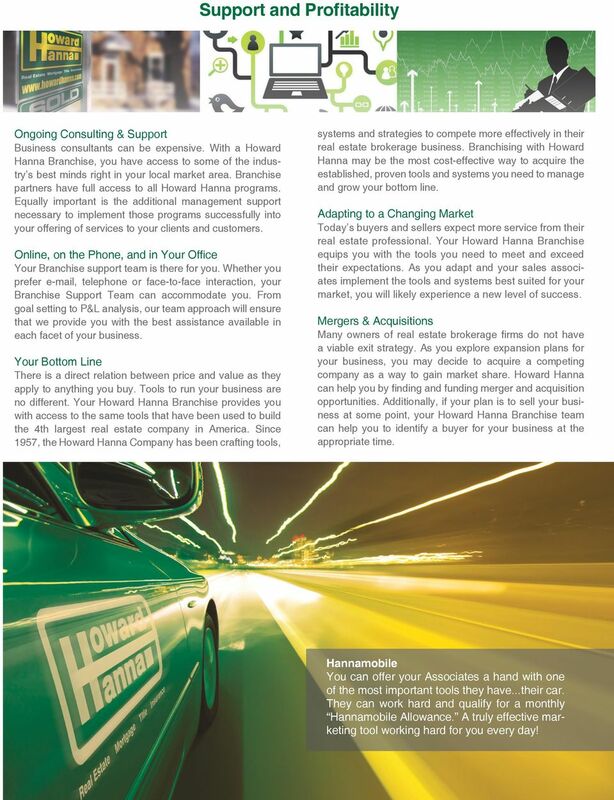 My affiliation with Howard Hanna as a Branchise partner has made my business more valuable. 100% Agree How is Branchising different? The 4th largest home seller in the United States according to Real Trends magazine s most recent rankings, Howard Hanna Real Estate Services is a successful real estate brokerage business operator that actually helps you grow your income through Branchising. You are not charged a regional advertising fund fee. To assure connection, the Hanna Leads Network connects your company and your agents to customers and clients directly. Your Hanna Dashboard helps you and your agents effectively manage your leads to maximize income opportunities. We are also members of the national Realty Alliance - connecting you with more direct leads nationwide. We re a family owned and operated real estate brokerage business. Therefore, we better understand your day-to-day challenges operating a profitable real estate brokerage business. We re a regional company focused specifically on your region (more offices, more signs, more sales people and more referrals). We re actively involved in your market through listing, selling and relocation referrals, enabling us to drive more business to you. We are successful in Mortgage, Title and Insurance, and offer those services to all Branchise offices as additional tools to help you and your sales team increase your income. Branchising works whether you are located in the eastern, midatlantic or midwestern United States and beyond. Both established companies and those just starting have found that Branchising delivers more leads, grows your income and provides more support. 8 For more information, please don t hesitate to contact: Ron L. Dishler Senior Vice President, Branchising & Licensing Office: Ext 292 Cell: Tom Schoeller Senior Vice President, Branchising, Mergers & Acquisitions Eastern U.S. Cell: Glenn R. W. Henry Vice President, Branchising, Mergers & Acquisitions Midwestern U.S. Cell: All conversations are kept strictly confidential! MORE VISIBILITY. MORE TRAINING. MORE BUSINESS. We re serious about your success. IT S A NEW ERA A changing real estate industry. A fully revitalized brand. Why sell with Bean Group? Renovation Realty Franchising, Inc. A Letter from the Founders Thank you for your interest in our franchise system. To us, Renovation Realty is more than a business, it is an opportunity to truly help. How to Successfully SELL Your Home in Today s Market! Why a Management One Property Management Franchise? WHY RE/MAX? What are YOUR numbers? Asking Why RE/MAX? is just the start of what could be a life-changing conversation. Does Brand Matter to the Real Estate Consumer? 1-800-The-Maids www.themaidsfranchise.com The Maids was founded in 1979 as a residential housecleaning service. In 1980 we began franchising our system, and today we have offices across the U.S. and Canada. Why List Your Bald Head Island Home with Wendy Wilmot Properties? at jack conway & company, our success is based solely on the success of our real estate associates. Who is the No.1 brand in real estate? You are. Truth. The. About Real Estate Advertising COTTER $49.00. Cell: (805) 680-0769 Website: www.patticotter.com Email: Patti@PattiCotter.com. PUT you IN CHARGE OF YOU. Top 10 List the advantages of Selling your home with The Marysville Homes Group!